Tea and citrus fruits and juices are associated with a lower risk of developing ovarian cancer, according to new research. The research reveals that women who consume foods containing flavonols and flavanones (both subclasses of dietary flavonoids) significantly decrease their risk of developing epithelial ovarian cancer, the fifth-leading cause of cancer death among women. The research team studied the dietary habits of 171,940 women aged between 25 and 55 for more than three decades. The team found that those who consumed food and drinks high in flavonols (found in tea, red wine, apples and grapes) and flavanones (found in citrus fruit and juices) were less likely to develop the disease. Ovarian cancer affects more than 6,500 women in the UK each year. In the United States, about 20,000 women are diagnosed with ovarian cancer each year. Prof Aedin Cassidy, from the Department of Nutrition at UEA’s Norwich Medical School, led the study. She said: “This is the first large-scale study looking into whether habitual intake of different flavonoids can reduce the risk of epithelial ovarian cancer. “We found that women who consume foods high in two sub-groups of powerful substances called flavonoids — flavonols and flavanones — had a significantly lower risk of developing epithelial ovarian cancer. 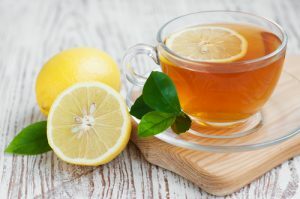 “The main sources of these compounds include tea and citrus fruits and juices, which are readily incorporated into the diet, suggesting that simple changes in food intake could have an impact on reducing ovarian cancer risk. “In particular, just a couple of cups of black tea every day was associated with a 31 per cent reduction in risk.” The research was the first to comprehensively examine the six major flavonoid subclasses present in the normal diet with ovarian cancer risk, and the first to investigate the impact of polymers and anthocyanins. The study was led by Prof Cassidy and Prof Shelley Tworoger, from the Brigham and Women’s Hospital and Harvard Medical School. Data was derived from the Nurses’ Health Study. This article was originally posted on Sciencedaily.com.